We had a lovely stay - party of 4 adults and 2 children. The villa was clean and well equipped. Lovely pool. Kids loved the trampoline. Made use of the bbq most evenings to enjoy the panoramic views. It is close to the local coop wine cave and around a ten minute walk downhill to the village with its small supermarket, boulangerie and pharmacy. Local restaurants were also good. Incredibly convenient for Bezier airport, but still very quiet and peaceful. The bikes were great for having a pleasant ride along the Canal Du Midi to the local beach (which could also be reached by a short bus ride). Hopefully we will get back soon! Thank you for a superb review. It is great that the children really enjoyed the trampoline and pool, while the adults enjoyed the peace and views. I hope you will become a regular guest as many other guests have visited us several times. We would like to share that we have just returned from the most fantastic 2 week holiday to this villa. We have 3 young girls and it was just perfect. Totally private and yet we could walk to the village which was just lovely and had everything you need. The villa was spacious and so well equipped and beautifully looked after. The pool was used every single day and was gorgeous. The electric shutters and air con were of huge benefit. We loved the 2 different eating areas. One in the sun with views out from the villa and one shaded by the pool. The bedrooms were large and spacious and we found the outdoor shower etc so useful. We particularly loved Portiragnes Plage as a small, family resort with beautiful beach and great restaurants, it was only 5 min drive away and we went most days. We explored Beziers, Carcassonne and Cap D'Agde and loved all. The food, wine, cheese etc were all divine and people so friendly and helpful. Just as an extra note we travelled from london direct to avignon on the eurostar and loved it - super experience all round and will definitely return. Thank you Sean. This villa had all the amenities we needed to have a thoroughly enjoyable holiday. Our two teenage children loved the pool and of course, wifi. It was lovely having a bbq every evening looking out on fantastic views. Large bedrooms with air conditioning was also very much appreciated. The villa is in easy reach of two very convenient supermarkets. For places to visit, we would recommend Carcassonne and Montpellier. Hope to come back again. we really enjoyed the villa..
We have just returned from a wonderful week in Portiragnes. The villa was lovely very easy to reach from Bezier airport . 3 huge bedrooms with very comfy beds. 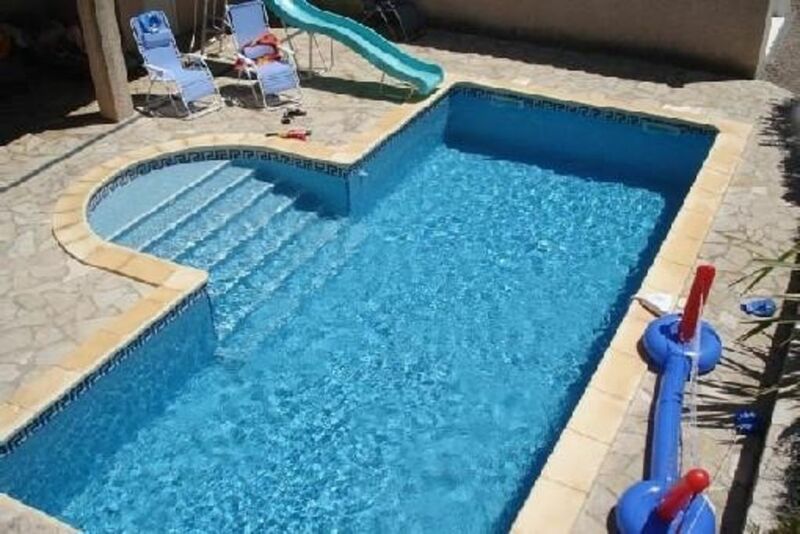 A great pool and fitted out comfortably for 6 people. The area has many attractions and we would recommend Sete and Villas Plage .Highly recommended . We spent 2 weeks in Portiragnes in September 2010 and enjoyed our vacation very much. The villa is perfectly located, very quiet, in a lovely village where you will find everything for your daily life (don't miss the weekly market), by far preferable to the seaside resorts - but still close enough if you want to hit the beach and give up the privacy of the villa's splendid pool and lush garden. The villa is well equipped and has everything to entertain up to six people, everything is in good condition. Also the surroundings allow for all kinds of activities, there are lot of spectacular places to visit within driving distance, romantic restaurants to dine in and wineries to discover. We hope that you will enjoy your vacation as much as we did! This review describes our lovely villa extremely well. We are delighted that so many of our visitors really enjoyed their visit and have returned to stay with us again.